After becoming the most used webserver among the top 1,000 websites earlier this year, Nginx just reached the next milestone by overtaking Microsoft-IIS in our surveys, which cover the top 10 million websites. Nginx is now used by 14.8% of all websites, that is more than 1 out of 7 sites. It is also the fastest growing webserver technology, gaining an additional 685 of the top 10 million sites every single day. The popularity of Nginx is even much higher when looking at high-traffic sites, reaching a level of 37.2% of the top 1,000 sites. 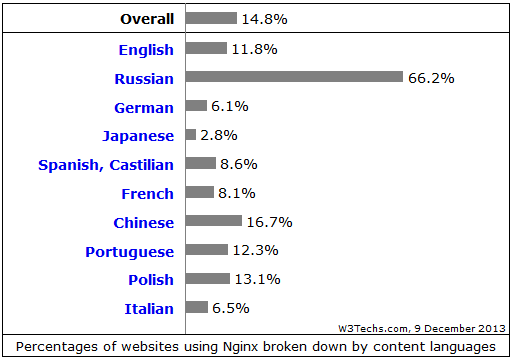 Usage of Nginx in different regions of the world varies a lot, as indicated in our language distribution chart: Nginx is used by 11.8% of English language sites, by 66.2% of Russian sites and by 2.8% of Japanese sites. There is, however, one common pattern: its popularity is rising everywhere. While Apache is still the undisputed #1 webserver, we would be surprised if the growth of Nginx would stop here.